What is stenciling? Actually, it's the negative form or opposite of stamping. Then put the paper onto the surface that you would like to decorate. 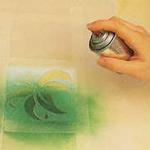 Color the blank space in the paper, using a special spray, (that's the best) or a brush. Then take the paper away, and enjoy your finished work. A tip: try to color with two or more color, not only with one.